It's no secret that I have a crush on stripes. They have been my go to pattern for several months. Stripes are awesome, but for me tend to lean toward the casual side of things. I have had my eye on this sequin striped tee that could dress a look up. We are on our way to Moab for some hiking and rafting for our anniversary, and I am so excited. What are you all up to this weekend? i loooove that top and stripes. def. 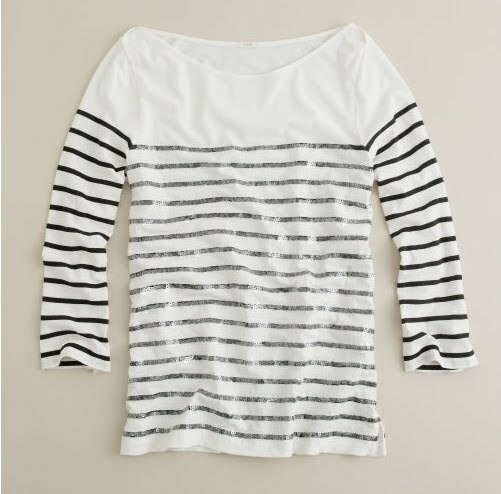 would not want to spend $72 on it only bc i own like 20 different striped tops and my husband would think im crazy! buuuut, i dont have any with sequin's in them!!! I recently made my first purchase at Forever 21, a striped shirt that you suggested for Sue Peterson (I follow her blog) for her photoshoot. I can't wait for a bit of cooler weather in PA so I can wear it! Have fun this weekend with your hubby!! Love it. I am crushing on stripes too! Perfect for summer and they are just all around classy. Who doesn't love this tee. It's pretty. Rafting and hiking sounds like a perfect weekend. I think I'll go shopping. Ooooh I LOVE that top!! I was a little sad when I saw the price. :( Maybe there is a less inexpensive imposter top somewhere out there? I'm not ready to spend $72 on this. I've actually been thinking about this top from Forever 21, but thought it looked too similar to what I already have. buuuut, if I sewed some sequins on there like the J Crew one, that would be awesome! !